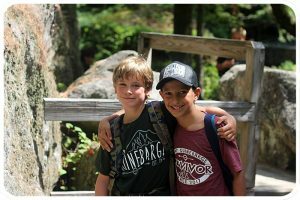 As summer approaches each year, many parents ask themselves “Should I send my kid to sleepaway camp or day camp?” This is a tough question for many parents, but while the thought of sending your child away for two or more weeks may induce anxiety, sleepaway camps provide many benefits that their day-only counterparts may not. In our eyes, the most important things that Camp Quinebarge gives to our campers are a sense of community, wonderful memories, and friendships that last campers’ entire lives. Quinebarge counselors are specially trained to run our fun, adventure-filled program, keeping children busy all day long. We intentionally create a community where acceptance, respect, kindness, and -above all- friendship are valued, and encourage campers to bond through team building activities, small group trips, and nightly Candle Pass with their cabins. We guarantee that campers will go home with warm summer memories, and friends that they will cherish for a lifetime. Face time over screen time– at Camp Quinebarge, campers are 100% electronic free. Not only do experts say that screen-free time, spent in nature, reduces stress in children, but living at Camp away from phones and social media means that kids interact face-to-face with their peers, focus on the present, and fully experience each activity, trip, and moment Quinebarge has to offer. Developing life skills – Living away from home for two or more weeks builds an incredible amount of independence in children. Campers are responsible for keeping their cabins neat, waiting at meals, and choosing their own activities. In activities, campers work as a group, building on their communication, teamwork, and cooperation skills. 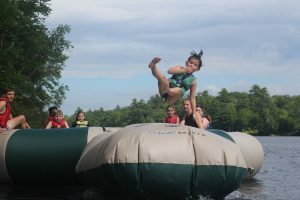 After even two weeks at Quinebarge, campers return home more confident, responsible, and self-aware than they arrived. 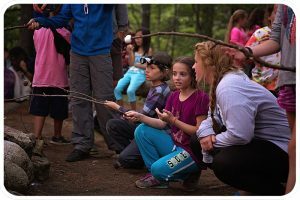 Building resilience – Most kids experience some level of homesickness while they’re at Camp, and that’s ok! Our staff are trained to support campers and help them conquer their homesickness. And not to worry – feelings of homesickness are completely normal, and don’t mean that a camper isn’t having a blast at Camp. Even when they’re feeling homesick, our campers tell us that they’re having fun at their activities and with their friends. And when these same campers go home, they do so with a newfound confidence and sense of accomplishment at overcoming their homesickness.